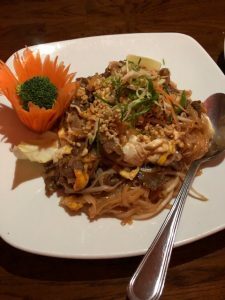 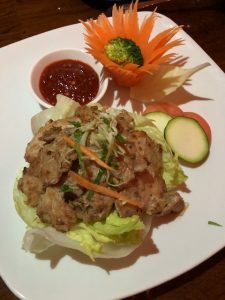 Specializing in traditional Thai cuisine, this Sapperton neighborhood spot has a wonderful menu filled with classic flavourful dishes; owner Teg Brar opened this restaurant over 6 years ago and has been welcoming diners ever since. 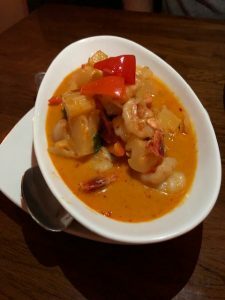 Loved both curries that I tried, Gaeng Panang, a curry with kaffir, bell pepper, pineapple, broccoli & peanuts fried in coconut milk and wild salmon; along with the Gaeng Kua Sapparod, a curry with Pineapple, kaffir, onion, bell pepper & red curry paste roasted in coconut milk with tiger prawns. 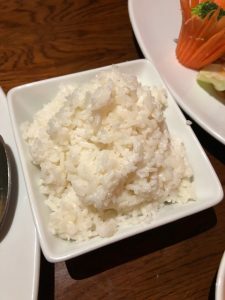 A side of the Coconut Rice was perfect to enjoy the remaining curry sauce. 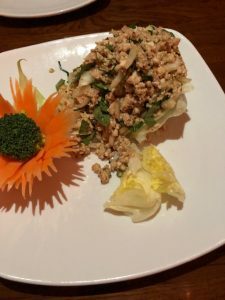 Larb was a Northern Thai warm ground delicacy salad tossed with chilli, roasted rice, onions, herbs and fresh lime; the Grilled Lemongrass Chicken was served with coconut rice; we had the traditional Pad Thai with beef, but you could also get it with other proteins such as chicken, prawns, or pork. 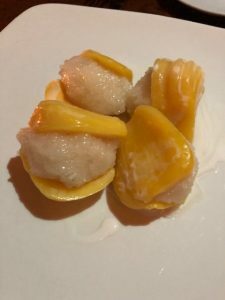 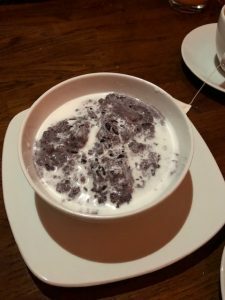 For dessert, my favourite of the two we had was the Sticky Rice with Jack Fruit; the other one we had was the Kao Niew Pieke (black rice pudding) with black sticky rice, taro, longan, coconut meat & fresh coconut cream. 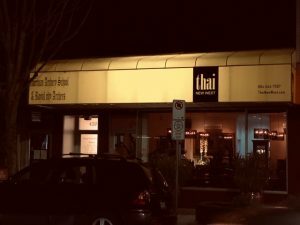 They offer a nice wine list as well as other traditonal beverages which include Thai Iced Tea and Thai iced coffee. 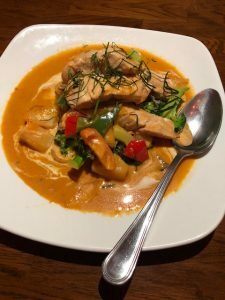 A great place to dine when visiting the Sapperton neighborhood.